A packed room of HR professionals recently attended the CIPD (Chartered Institute of Personnel and Development) briefing at The Clayton Hotel, Cork sponsored by Fastnet – The Talent Group® and chaired by Mari Manning, CIPD Chairperson (Southern Region). 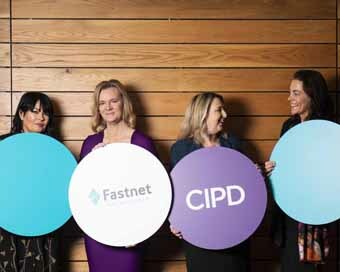 Speaking at the event Niamh O’ Driscoll, Managing Partner Fastnet – The Talent Group® commented “As HR professionals we are all in the business of cultivating and sustaining workplaces where people can flourish and reach their full potential. Successful talent strategies are about creating memorable, impactful and sustainable employee experiences – not only because it’s the right thing to do but because it’s the only certain path to business success and long-term competitive advantage”. Guest speakers Linda Hayes, HR Director BioMarin, and Laura Healy, MD Renovar Ltd, shared their personal insights based on vast experience in senior Strategic HR roles at a variety of leading global organisations. Linda Hayes, HR Director BioMarin, shared her views on the importance of showing vulnerability in the workplace, for individuals to be courageous, exemplary authentic leaders. She advocated that “true leadership requires nothing but vulnerability, values, trust, and resilience”. Linda went on to talk about the fact that talent impacts everything but the three critical items that have real impact are: ‘Know your market, know your data and know your people’. To close, Linda gave a powerful summary on what has shaped her as a leader – pure determination and grit, always curious and learning, humility, believing in people, a sense of HR always standing strong and accepting that we are all human. Laura Healy, MD Renovar Ltd, spoke about her personal perspective on how an integrated strategic approach to Talent Management is imperative to drive optimal levels of business success. Laura’s view is that there are three critical elements to a successful Talent Management Strategy: Hiring for potential, an ‘everybody culture’ and making strategy a reality. She went on to say that making strategy a reality “will live or die” based on the quality of the leaders in the organisation. She stressed the need for inclusivity and the need for “Organisations to embrace the capabilities of the entire workforce, offering learning opportunities every day”. Commenting on the success of the event and thought-provoking presentations, Mari Manning, Chartered MCIPD, Chair, CIPD Ireland-Southern Region spoke about “courage and vulnerability being interlinked, perhaps it’s something we should all reflect on within ourselves”. Pictured ( l-r): Linda Hayes, HR Director BioMarin Pharmaceutical Inc., Niamh O’ Driscoll, Managing Partner, Fastnet – The Talent Group, Mari Manning, Chartered MCIPD, Chair, CIPD Ireland-Southern Region, Laura Healy, MD Renovar Ltd. Photography by Clare Keogh.